DOWNLOAD THE THIN VENEER SPEC SHEET TO SEE OPTIONS FOR STONE TYPES, SHAPES, SIZES, COLORS AND TEXTURES. Stoneyard® Boston Blend mosaic stone veneer, purchased from Swenson Granite Works’ Rowley store and installed by Stone Waleryszak. Thin stone veneer can be installed over an existing fireplace, which eliminates the challenge of removing the original masonry underneath. The stone is cut thinly enough to maintain the authentic look and feel of real stone without the heavy weight of a 3-6 inch deep stone veneer, making installation fast and simple. 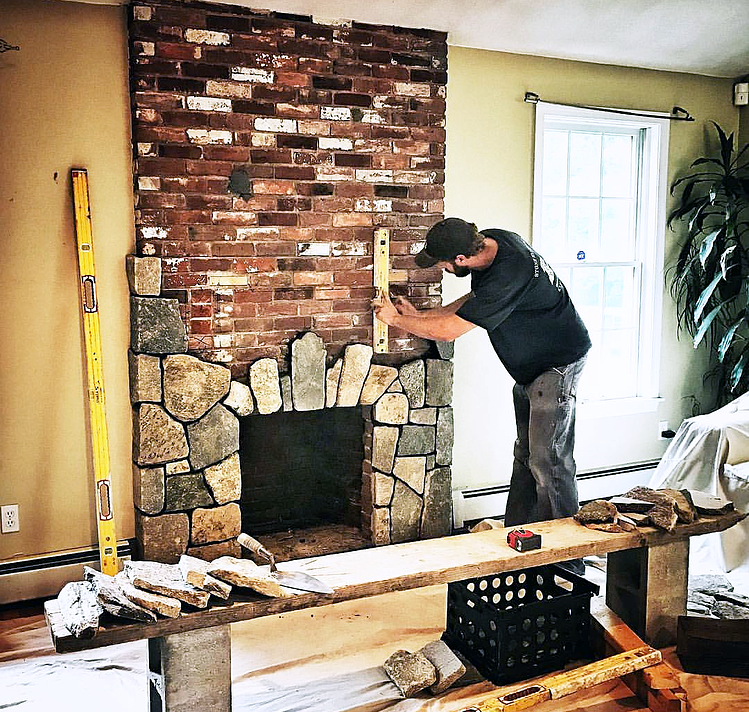 Mike Mehaffey, owner of the Exeter, NH-based masonry company Stone Waleryszak, shared his team’s process of installing Boston blend mosaic thin veneer over a brick fireplace. The stone was purchased through Swenson Granite Works’ Rowley store. 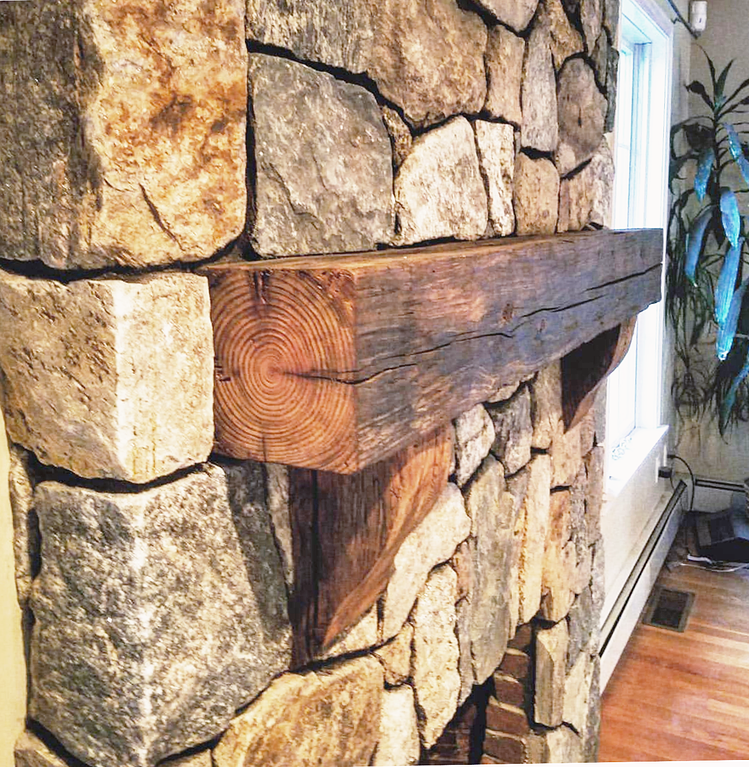 “Aesthetic wise, the stone definitely looks nicer (than concrete-based or artificial stone alternatives), and also you can get away with a 2-inch stone veneer onto an area where you potentially don’t have a brick shelf”, explained Mehaffey. While brick or thick stone veneer could require a base structure as deep as 4 feet into the ground, “with thin stone veneer, you can build right off the wood floor because it’s bonding to the actual structure and not bearing weight on the floor.” Not only does this reduce costs and simplify the installation process, but it gives homeowners the flexibility to create a natural stone appearance with almost any fireplace in their home or backyard. Thin stone veneer offers an affordable alternative while also maintaining the look and feel of real stone. The installation process can vary slightly depending on the existing material on the fireplace, the type of stone desired, and the preferences of the homeowner. 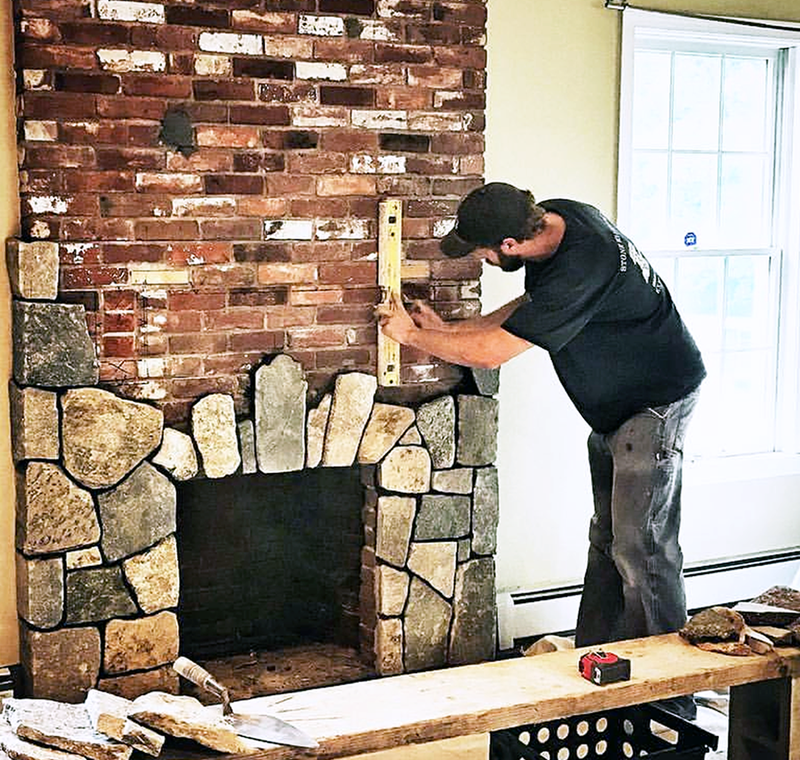 After measuring out the dimensions of the fireplace, the contractor installs corners on the interior of the fire box and then up against the wall, cutting them to create the illusion of the stone protruding from the wall instead of flat veneer. “If you’re dealing with brick, block, or any sort of masonry, you can just stick the veneer right to it with an acrylic bond enhancer,” said Mehaffey. If adding gas inserts to the fireplace, the contractor will add a concrete board around the inserts, then tape the joints and add a scratch coat of mud. Next, the contractor creates a design with the stones, staggering shapes and sizes and spacing the stones closely together (Powers, This Old House, 2018). Corner pieces are also used to add dimension. Depending on the type of stone, the contractor will use a hammer or masonry saw to cut and align the pieces, crafting the design of the fireplace. “We used to use manufactured stone mortar, but now we’ve started using a Type S mortar and add the acrylic bond enhancer to make it have a better bond,” said Mehaffey. He recommends adding water slowly and whipping properly when mixing the mortar to achieve a stiff, sticky mix. The veneer pieces are then installed from the top of the fireplace down and the mortar is left to cure overnight. The next day, the joints are grouted, cured, and brushed to achieve the desired look (Powers, This Old House, 2018). 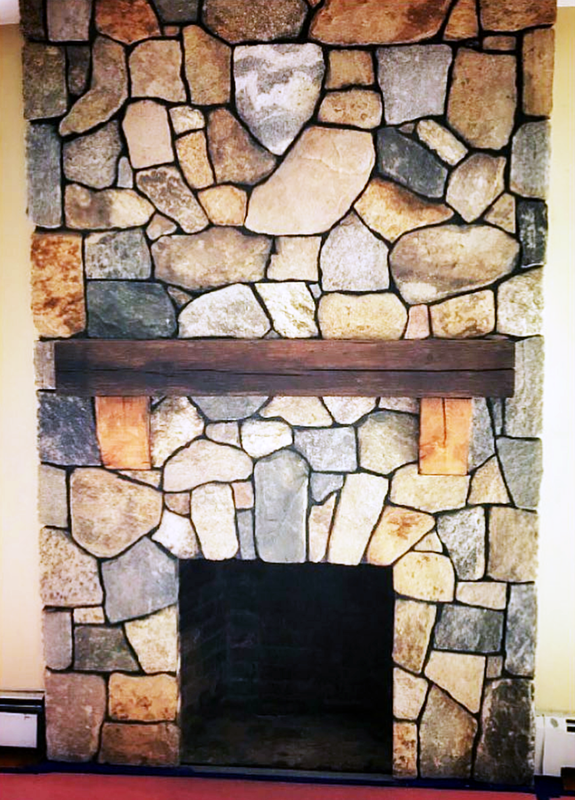 Interested in transforming your indoor or outdoor fireplace with thin stone veneer? Call or visit your local Swenson Granite Works store and we can help you choose the right stone for your project. Take a look through The Heart of the Home Inspiration Guide for more ideas on how to incorporate an indoor or outdoor fireplace into your home design. Download it here.